Germany pneumatic nebulizers market to procure substantial proceeds by 2024, portable breath-actuated products to garner commendable acclaim « Global Market Insights, Inc.
Pneumatic nebulizers market is slated to experience remarkable growth prospects in the years to come, owing to the product’s prominent application in the medical and pharmaceutical space. Given the surging prevalence of asthma and COPD (chronic obstructive pulmonary disease) across the globe, the demand for nebulizers has been continually surging in respiratory disease treatment. As per estimates, the global aging population was recorded at 809.4 million in 2012. 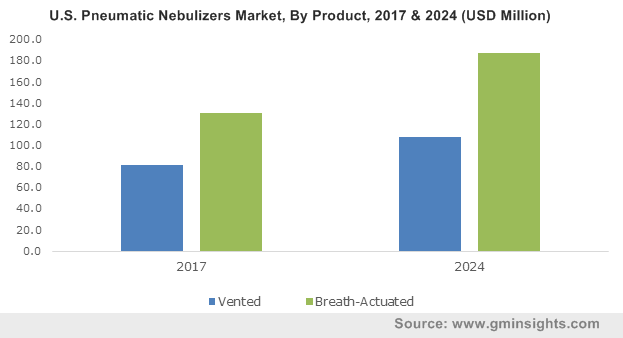 The fact that the elderly are more vulnerable to respiratory diseases will be a major driving factor for the development of pneumatic nebulizers market. Of late, automation and the emergence of IoT have resulted in surging technological advancements, which has led to the development of various high-end products. The availability of such products is likely to contribute toward the quick and effective treatment of many disorders, which will favor pneumatic nebulizers market growth. The U.S. is expected to invest heavily in technological developments over the coming timeframe, pertaining to which U.S. pneumatic nebulizers market will exhibit considerable annual growth rate over the years ahead. The growth can be attributed to the favorable initiations taken by regional governments to create awareness among the masses about the benefits of early respiratory disease treatment. Easy availability and heavy utilization of technologically enhanced portable products will also propel the pneumatic nebulizers industry growth notably. Of most products, portable nebulizers – breath-actuated vented portable products in particular, have gained considerable acclaim in the healthcare space. Research claims that the breath-actuated pressurized metered dose inhaler is known to resolve the problem of patient co-ordination of actuation with inhalation. Additionally, breath-actuated pneumatic nebulizers are endowed with the biofeedback feature that helps deliver optimum patient comfort. Powered by the fact that these nebulizers conserve medication all through exhalation instead of enabling it to escape & disperse, breath-actuated pneumatic nebulizers accounted for the largest revenue of USD 366.3 million in 2017. As per estimates, portable breath-actuated pneumatic nebulizers market has also been anticipated to register a CAGR of 6.1% over 2018-2024, primarily driven by the convenience these products offer as well as the ease of functionality and handling. The conspicuous size of portable nebulizers in tandem with the better outcomes in asthma treatment will also stimulate the portable breath-actuated pneumatic nebulizers market. One of the most developed and technologically driven countries of the West, the United States stands as a prominent contributor to the global pneumatic nebulizers market. One of the primary reasons for the same is the escalating adoption of smoking and the surging prevalence of chronic respiratory disorders that lead to a surge in demand for appropriate treatment. As per estimates, more than 25 million Americans are known to suffer from asthma while around 14.8 million adults are diagnosed with COPD. Prominently driven by the rising availability of reimbursements and insurance coverage, the U.S. pneumatic nebulizers market is estimates to register a CAGR of 4.8% over 2018-2024. Elaborating on the regional landscape, it is noteworthy to incorporate the mention of Germany, that has emerged as a viable contributor in the Europe pneumatic nebulizers market. Apparently, the regional held a share of 26.2% of the Europe pneumatic nebulizers industry in the years 2017, essentially on account of the increasing prevalence of smoking and air pollution that has led to the occurrence of a spate of diseases, most prominently COPD. Powered by the rising adoption of pneumatic nebulizers for respiratory treatment and the presence of pivotal players in the region, Germany pneumatic nebulizers market share is anticipated to soar high in the years to come. The global pneumatic nebulizers industry is replete with a slew of prominent giants that are planning to expand their global presence by investing significant capital into low and middle-income countries. Adopting growth strategies such as mergers and acquisitions is rather commonplace in this industry, for companies to strengthen their presence. Some of the noteworthy participants in pneumatic nebulizers market are Philips Respironics, Becton Dickinson, Omron Corporation, DeVilbiss Healthcare, ARI Medical, Heyer Medial AG, Briggs Healthcare, and Salter Labs. This entry was posted in Healthcare & Medical Devices and tagged Pneumatic Nebulizers Industry, Pneumatic Nebulizers Market, Pneumatic Nebulizers Market Analysis, Pneumatic Nebulizers Market Growth, Pneumatic Nebulizers Market Outlook, Pneumatic Nebulizers market pdf, Pneumatic Nebulizers Market Price, Pneumatic Nebulizers Market Report, Pneumatic Nebulizers Market Share, Pneumatic Nebulizers Market Size, Pneumatic Nebulizers Market Trends.